The Gardens: Lynn and Ted Steiner have lived in their 115-year-old farmhouse since 1985. They began installing gardens and landscaping soon after moving in and it remains an ongoing process. 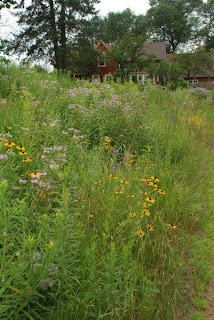 There are several mixed borders around the house, each containing a mix of native and nonnative perennials, grasses, shrubs, and trees. There is a raised-bed vegetable garden that also includes some herbs and small fruits. The prairie restoration/reconstruction is just under an acre in size. It was seeded in fall 2005 and was burned this spring. Lynn and Ted have been renovating their woodland since 2004, removing invasives, installing paths, and incorporating new plants. Their newest project is a savanna restoration started in spring 2011. It was burned for the first time this spring. Location: 15250 May Ave. N, Stillwater. It takes about 45 minutes from downtown Minneapolis. Look for a red farmhouse and barn on the west side of the road and a garden flag on the mailbox. There is plenty of parking near the house. Drive all the way up the driveway. At the top of the driveway, turn right and park in one of two areas next to the barn. This tour is a Wild Ones members only benefit. If you are not already a member, go to the membership page. In addition to this free tour, other membership benefits include national Wild Ones Journal and quarterly Wild Ones Twin Cities chapter newsletter, access to our chapter's native plant library and many other benefits with like-minded individuals.